After Norman Osborn escaped from the S.C.C. (Special Containment Center), he had ample opportunity to evade authorities and return to operating from the shadows. But Norman did not go into hiding, instead he opted for the calculated PR-maneuver of making himself into a political prisoner. He then turned himself over to the authorities and requested a fair trial. The plan appeared to work as the media bought-in to his pleas, and, with that, Osborn was transferred back to the Raft. There was a fairly high probability that Norman would have rotted away in the Raft had it not been for the help of the latest incarnation of Osborn-fanatics, known as the Green Goblin Cult. This new group of Osborn loyalists began infiltrating various aspects of society and was on its way to freeing Norman from incarceration for a second time. 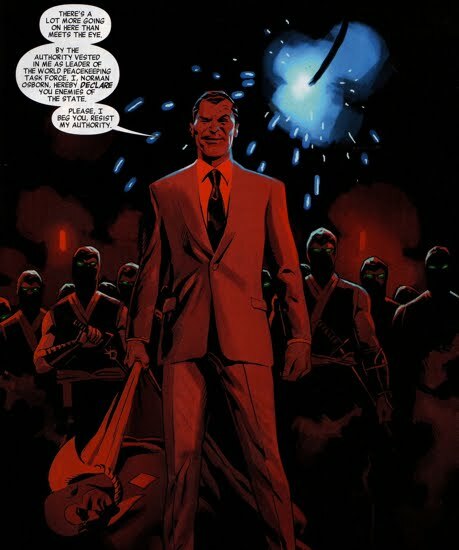 Under Osborn's direction, the clandestine cult began concocting a plan to lift Osborn right out from under the Avengers’ nose. Osborn’s once-mighty H.A.M.M.E.R. organization had suffered serious damage after Norman’s siege on Asgard and his subsequent arrest. However, H.A.M.M.E.R. did not die-out completely and a fraction of the troops continued to operate whilst Osborn was detained. Dr. Deidre Wentworth (aka Superia) assumed the leadership role of H.A.M.M.E.R., a role that would eventually put her in direct conflict with the Avengers. In New Avengers (V2) #10, Victoria Hand ordered the new Avengers to track Superia and her followers to Barrington, Rhode Island. The squad of super heroes quickly found themselves outmatched as Superia handed them a serious beat-down. Mockingbird suffered a (seemingly) mortal wounded during the conflict. During a conversation between Captain America and Ms. Hand in New Avengers (V2) #11, Victoria tells Cap that she was ‘invited through back channels’ to rejoin H.A.M.M.E.R. That explained her decision to send the Avengers to Rhode Island, a move designed to preemptively squash Superia before she created a national threat. Hand’s maneuver was further vindicated by Superia’s comments in New Avengers (V2) #10 when Superia appears to be have been caught off-guard by the new Avengers arrival and was convinced there was a traitor in her organization. Victoria Hand warned Captain America that there are a ‘good number of [Osborn’s] believers’ still out there operating in the shadows. While the new Avengers team anxiously awaited the fate of Mockingbird, Spider-Man became convinced that Victoria Hand was a double agent loyal to Osborn. Victoria, however, maintained her innocence and accepted the fact that the team did not trust her at all. Later explained in New Avengers (V2) #22, Victoria told the team that it was Norman Osborn who first reached out to her. After she told Cap about Osborn, Cap instructed her to go along with Osborn’s plan. Cap’s orders elucidated Hand’s actions at the conclusion of New Avengers (V2) #12 when Superia attacked her in her home. Victoria scolded Superia and her team for contacting her over secure S.H.I.E.L.D. lines and then went on to make a pact with Superia in order to aid the resurrection of H.A.M.M.E.R. Hand’s 'pact' with Superia appeared to pay off for the latter in New Avengers (V2) #13 when Superia got the drop on the new Avengers. While the team waited at a marina staking out Superia (which Hand had instructed them to do), the villainess arrived in a quinjet and nearly killed them all. 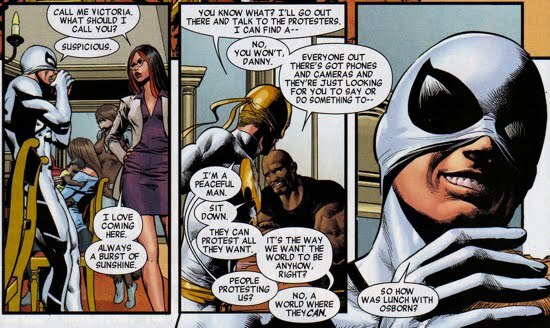 Eventually the new Avengers turned the table on Superia and were able to corner her, at which point she pleaded for her life and claimed to have the cure for Mockingbird. Just as she was about to hand over the ‘cure’, Nick Fury arrived and snatched the briefcase from Superia. According to Fury, three months prior H.A.M.M.E.R. forces had broken into a secret storage facility and stolen a formula that was originally created by the Nazis many years ago. Superia had her followers convinced that this formula was ‘the future’. Fury went on to explain that this formula was a mixture of the Nazi’s version of both the Super Soldier Serum and the Infinity Formula. The team was quite surprised by this revelation. Shortly after, the new Avengers returned to Mockingbird’s hospital room and Fury administered this concoction to a comatose Mockingbird…her eyes suddenly opened. 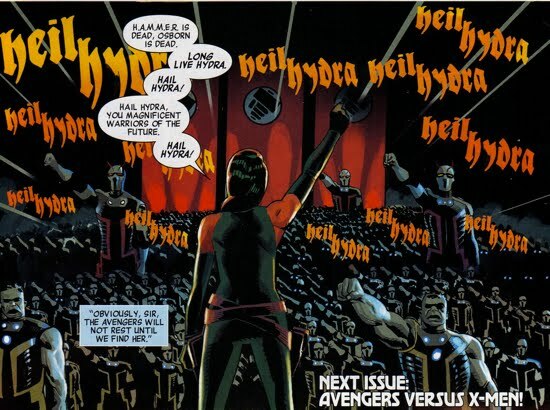 At the conclusion of New Avengers (V2) #13, Superia, who was now in S.H.I.E.L.D. custody at the Raft, received a note slid under her prison-cell gate. The note displayed the symbol of the new Green Goblin Cult…Superia was convinced that she had an ally in Victoria Hand. The resurrection of H.A.M.M.E.R. 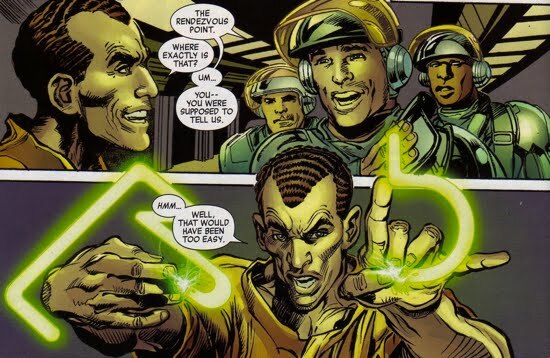 was not going to be fully realized until their undisputed leader, Mr. Norman Osborn, was freed from incarceration. The plot to free Osborn began to take shape in New Avengers (V2) #16.1, in which the imprisoned Osborn was battling his inner demons (literally). 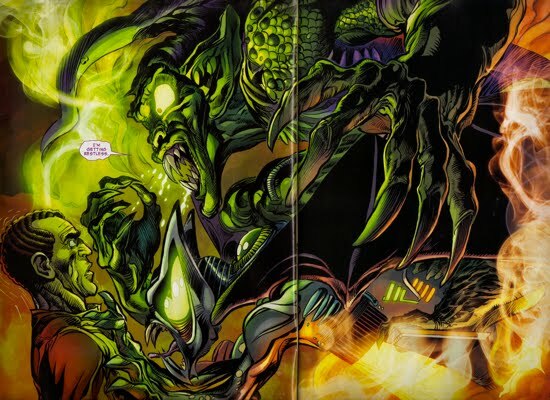 The Green Goblin (in a manner similar to Dark Avengers #16) haunted Osborn as a distinct entity clamoring about its ‘restlessness’ and desire for Osborn to join his followers and embrace his destiny as ‘the future’. Osborn succumbed to the pleas of the Green Goblin. 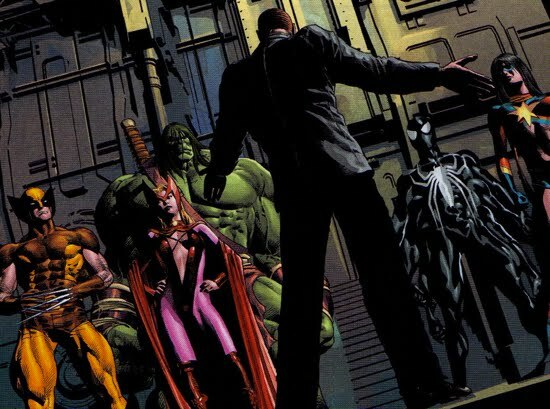 Meanwhile at Avengers mansion, Victoria Hand briefed the new Avengers about their latest mission, the transfer of Norman Osborn from the Raft to a different holding facility. The move was required as part of the preparation for Osborn’s trial in an international criminal court. The authorities wanted some muscle as well as something flashy for the cameras, thus the new Avengers were tasked with the guiding the transfer. However, the transfer failed miserably despite the new Avenger’s clever strategy for escorting Osborn from the Raft. They used Dr. Strange as an Osborn-decoy (Dr. Strange used a spell to change his appearance) in order to bait Osborn's henchmen out of the woodwork. Dr. Strange quickly found himself abducted by Osborn fanatics. 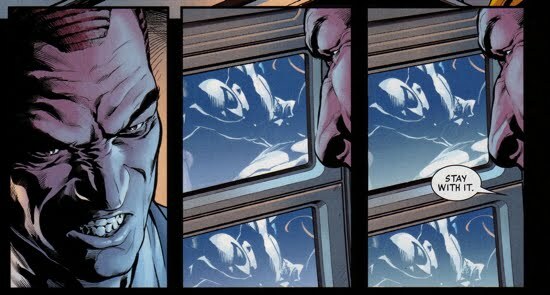 Unfortunately, the lackeys were unaware of the rendezvous point (they expected Osborn to tell them where it was) and Strange quickly reconverted himself back and placed them under arrest. Meanwhile, in a separate underground tunnel, Wolverine, Jessica Jones, and Iron Fist escorted the real Osborn out of the Raft. Osborn provoked Jessica by informing her that he was going to kill her baby (a baby that he had helped to rescue and that he had almost killed even longer before that). 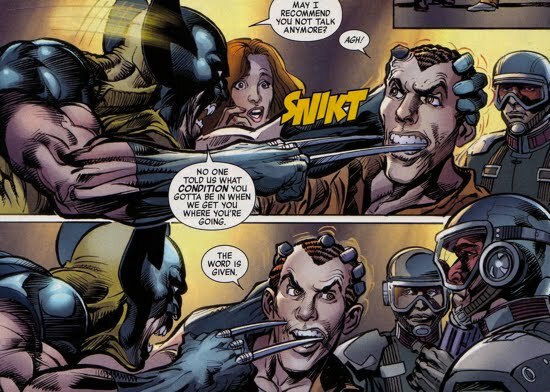 After Wolverine nearly ripped Osborn’s head off for his comments, Norman instructed the escorting guards that, ‘the word is given’. 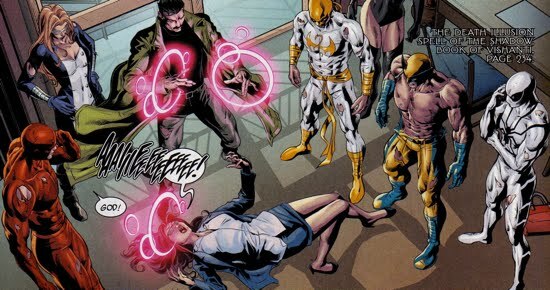 The guards (aka Osborn loyalists) immediately blasted Wolverine in the face, neutralizing him whilst Osborn took down both Iron Fist and Jessica Jones. Osborn then escaped with the guards and, before exiting the Raft, he freed Superia from her holding cell. Norman met Superia for the first time when her prison cell door slid open, which presented an interesting question as to why she took over H.A.M.M.E.R. despite having never met Norman prior to that day. Shortly after, Osborn found himself at the H.A.M.M.E.R rendezvous point in front of a massive crowd cheering him on. He shared the stage with Superia and Madame Hydra (aka Viper). More facts about Osborn’s escape were brought to light in The Avengers (V4) #19 during the interrogation of the Raft’s warden, S.H.I.E.L.D. Agent John Walker (aka U.S. Agent). He had been drugged during the escape and, unknowingly, had 14 of Osborn’s operatives under his watch at the time. One of those agents even had a shrine dedicated to Osborn. It was also revealed that the Osborn sympathizers pulled the security cameras offline, aiding in the escape. Agent Walker was convinced he was being set-up as the fall-guy. Before Osborn took the stage alongside Madame Hydra at the conclusion of New Avengers (V2) #16.1, a flashback sequence in New Avengers (V2) #18 revealed their first meeting at H.A.M.M.E.R. headquarters. Madame Hydra alluded to a prior meeting they had shared when she stated, ‘let’s put all that behind us for now’ after Osborn had asked her if they had ever met before. After being ‘introduced’ to Madame Hydra, Norman also greeted both Gorgon and Dr. Monica Rappaccini (aka A.I.M.’s Scientist Supreme). The conglomerate of villains pooled together the resources of Hydra, The Hand, A.I.M., and the remnants of H.A.M.M.E.R. Osborn consolidated them all under the umbrella of H.A.M.M.E.R. and assumed the lead role. In an attempt to pay homage to Osborn’s prior exploits, Madame Hydra explained to him why she was willing to fall in line him. She explained that he was the ‘one piece’ she had been missing in order to defeat the Avengers. She stroked his ego by saying that before he was put away, Osborn had given a voice to the disenfranchised and instilled something in people that ‘had been missing for many years’. She was tired of losing and believed Osborn was the answer. Osborn accepted the nomination. As an aside, Madame Hydra’s message to Osborn invoked a strong ‘anti-corporate America’ policy as part of her new world order. 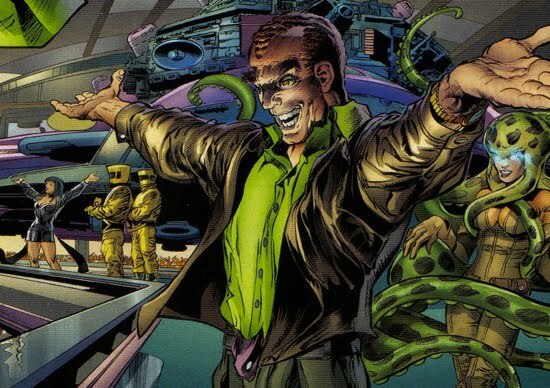 Yet it is a well-known fact that Osborn became extraordinarily wealthy with the formation of his chemical corporation (Osborn Industries/Oscorp). Would it not be hypocritical of her to begin an anti-corporate coup whilst using a former corporate magnate as her leader? The ridiculousness of Madame Hydra’s statements to Osborn began to make more sense in a flashback sequence from New Avengers (V2) #19 during a conversation between Madame Hydra and Gorgon. 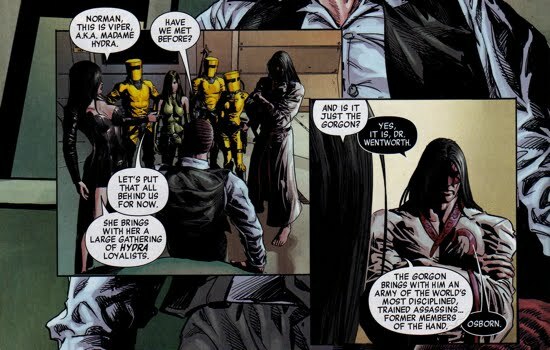 During that conversation, Madame Hydra implored Gorgon to follow Osborn because she knew that Osborn would eventually fail and that they would inherit everything he built. When Gorgon denied her plan, she swore vengeance on him as well. So, Madame Hydra had ZERO loyalty to Osborn (and Gorgon for that matter) throughout the entirety of their time together. Norman further explained his confidence stating that he has a ‘man on the inside’ (the insinuation of course was that he was referring to Victoria Hand). As a quick editorial, a fairly blatant continuity flub occurred during Osborn's recruiting of Skaar back at the Savage Land. 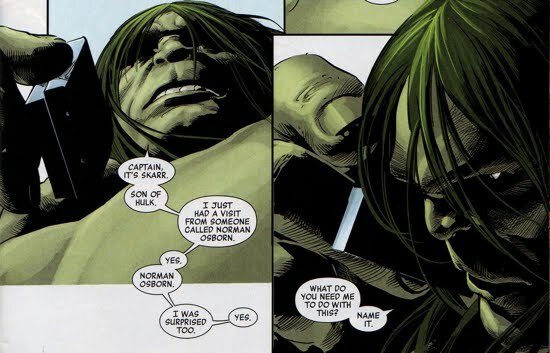 Skaar expressed to both Norman and Captain America that he did not know Osborn. 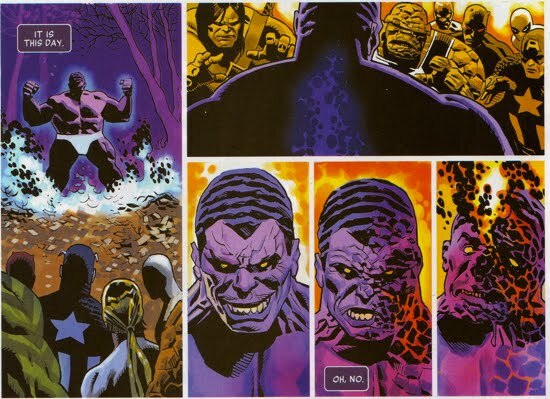 But the two share a history, Osborn tried to get Bruce Banner killed by converting him into the Hulk and allowing Skaar to kill his father (as an act of vengeance). Osborn's mission failed, but it should have remained somewhere in Skaar's memory bank. Regardless, Skaar had no loyalty to Osborn at any point as revealed in a flashback sequence in New Avengers (V2) #23. The initial conversation between Skaar and Osborn was expanded to show that Skaar had immediately phoned Captain America and asked for advice on how to handle Osborn’s request. Cap instructed Skaar to join and thus function as a mole inside Osborn’s organization. 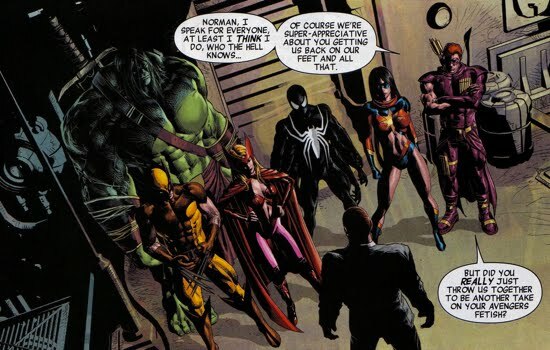 Skaar complied and Osborn’s latest attempt at an alternative Avengers squad was now complete with liars AND traitors! Osborn’s first offensive maneuver against the established Avengers team commenced in New Avengers (V2) #17 at the Stark Resilient Satellite Laboratory in New Jersey. Osborn used a remote-controlled Ultimo robot to attack the facility in an effort to regain one of Stark’s armored suits (recall Osborn’s confrontation with the Ultimo technology in during Dark Reign). When the new Avengers thwarted Osborn’s initial attack, Osborn quickly shifted his mission objective and used a robotic spider to collect a blood sample from Wolverine. Osborn had the sample immediately brought to his hidden lair and the new Avengers remained baffled as to who was behind the attack. After taking a second look at Spider-Man on the monitors at his headquarters, Osborn ordered the Ultimo robot to self-destruct. The explosion nearly killed the entire team. 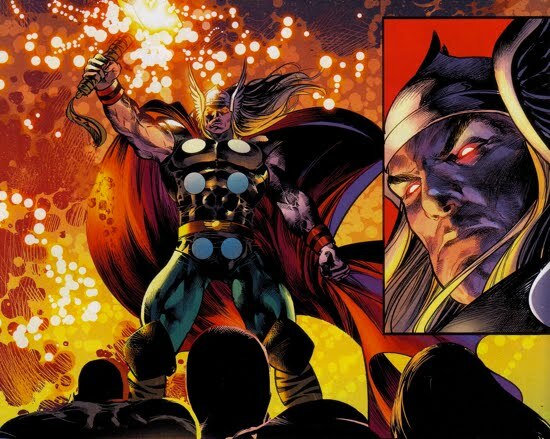 The aftermath of the Ultimo explosion was continued in New Avengers (V2) #19. As the team recovered from the blast, Spider-Man lamented over his history with Norman Osborn. Spidey blamed himself for the fact that Osborn remained at large and posed such a threat to society. 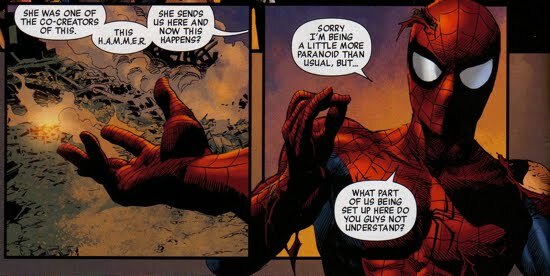 When the team returned to Avengers Mansion, Spidey continued to needle Victoria Hand as to her involvement with Osborn. She vehemently denied any collusion with her former boss. After a heated discussion with the team, Victoria sent the new Avengers on an improptu mission to Miami. However, at mid-flight the team was re-routed because Hand had provided incorrect coordinates, costing them some time. When they eventually arrived, they witnessed Osborn and his new (Dark) Avengers team performing a heroic deed…squashing an Atlantean attack! 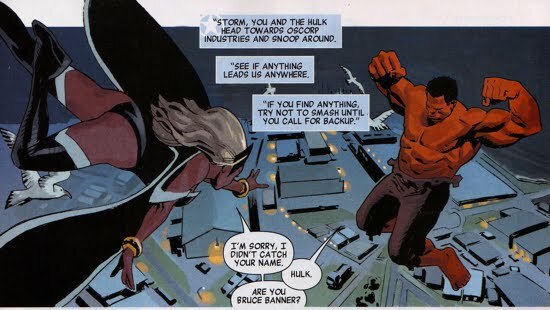 Osborn’s (Dark) Avengers and the new Avengers collided in New Avengers (V2) #20 as Luke Cage led the attack against Osborn. 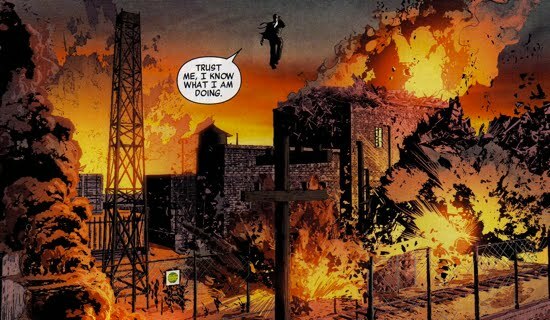 In an effortless manner Osborn tossed Cage aside (perhaps some payback from the Pulse #4), launching him through the air. Spider-Man immediately recognized that something was amiss with Osborn’s immense strength. As the heroes and villains did battle, Superia brought down the New Avengers quinjet, harming innocent civilians. Sensing the urgency to flee, Dr. Strange performed a massive illusion to generate a fake tidal wave. This diversion allowed the new Avengers to safely escape, but their respite did not last long and they were soon greeted by Dark Thor (aka Ragnorak)! The action continued in New Avengers (V2) #21 as Dark Thor brought the fight to the new Avengers and proved to be almost too much for them to handle. Eventually, thanks to Spidey and Iron Fist, the team subdued Dark Thor whilst Osborn and his team watched from afar. Osborn’s squad squabbled amongst each other as to who should ‘finish off’ the new Avengers, but Osborn squashed any such notion. Norman had no intention of making martyrs out of the heroes and instead insisted that his team help the civilians in an attempt to sway public opinion. 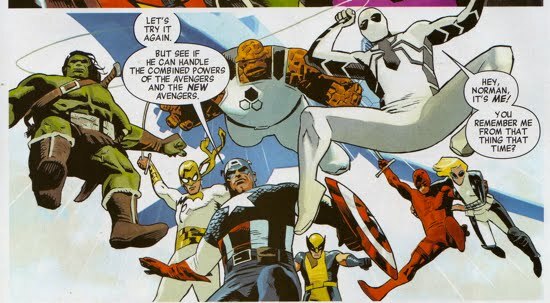 Osborn’s team complied and as they were preparing to do so, the new Avengers dropped the destroyed Ragnorak (corpse?) to the ground in front of Osborn. The new Avengers then returned to New York to find their mansion seized by the Federal government. Amid the new Avengers struggles with Osborn and his new team, the (adjective-less) Avengers also found themselves battling with the former Green Goblin. Their troubles were rooted in the deception created by a disgruntled S.H.I.E.L.D. agent, Dr. Carolina Washington. She had been secretly conspiring against the Avengers and S.H.I.E.L.D. for years. In short, she had stolen superhuman DNA (as well as other superhuman secrets) after events like the Superhuman Civil War, the assassination of Captain America, the Skrull Secret Invasion, and Blitzkrieg U.S.A. Dr. Washington then handed all those secrets over to Norman Osborn in The Avengers (V4) #18 as she explained that she was fed up with the lack of accountability on the part of the ‘heroic’ community. Carolina resented the fact that as a S.H.I.E.L.D. forensic scientist specializing in abnormal genetic material, she was constantly required to clean things up with no questions asked. Agent Washington of S.H.I.E.L.D. quickly became Agent Washington of H.A.M.M.E.R. Soon after, during a press conference featuring Tony Stark’s new lineup for the Avengers in The Avengers (V4) #19, Norman Osborn arrived and publicly accused Stark and the Avengers of a litany of crimes against him. This maneuver by Osborn added fuel to fire for the growing resentment by the general public towards Captain America. An unfortunate reality that Cap was well aware of from the numerous protestors outside Avengers Mansion. 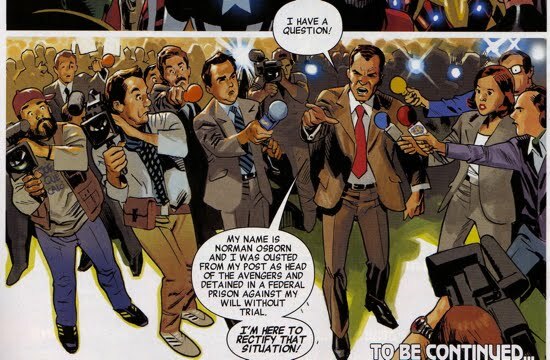 This incident represented the first time the general public was aware that Norman Osborn was no longer in S.H.I.E.L.D. custody. Captain America found himself under intense scrutiny by the public in The Avengers (V4) #20 as Osborn’s rant continued to throw the Avengers operation under the bus. Norman claimed that they removed him (Osborn) from power via a coup d’etat and that he was not given a fair trial. 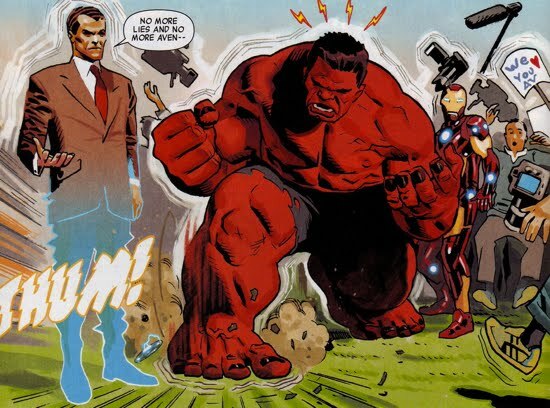 The Red Hulk attacked Osborn only to discover that it was a hologram of the H.A.M.M.E.R. leader, Norman remained safely in his H.A.M.M.E.R. headquarters. Osborn once again seemed to be able to captivate public opinion despite looking suspicious in his own right. 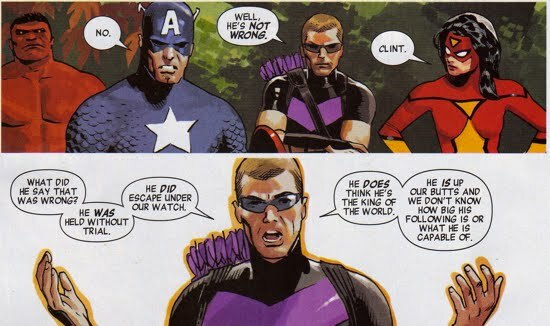 To counter Osborn’s public attacks at his credibility, Captain America decided to split his team of Avengers up to each investigate a potential lead on Osborn. Upon doing so, the Avengers quickly found themselves in a trap, one cleverly set by Osborn. At Thunderbolts Mountain, Hawkeye and Spider-Woman were attacked and captured by H.A.M.M.E.R. agents that possessed a mixture of Spidey and the Hulk’s power set. Meanwhile, at Oscorp Industries (wait…what’s that name again? See here) in Long Island, Storm and the Red Hulk were attacked and captured by H.A.M.M.E.R. agents with the Wasps powers. In Philadelphia, Iron Man and the Protector attacked each other as Iron Man’s tech turned on him and attacked his fellow Avenger. Also, Captain America, Agent Hill, and The Vision were attacked by a H.A.M.M.E.R. agent with what appeared to be Giant Man and The Vision's powers. Cap and Hill were taken into H.A.M.M.E.R. custody; The Vision was able to escape. As a quick aside, the fact that Osborn transferred Spider-Man’s powers to group of H.A.M.M.E.R. agents suggests that Norman has Spidey’s genetic secrets…imagine the implications therein. 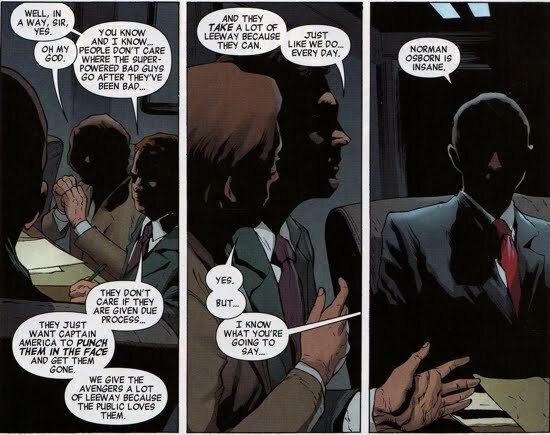 The dust Norman Osborn had been kicking up finally caught the attention of the President of the United States in The Avengers (V4) #22 as his staff briefed him over the recent events. 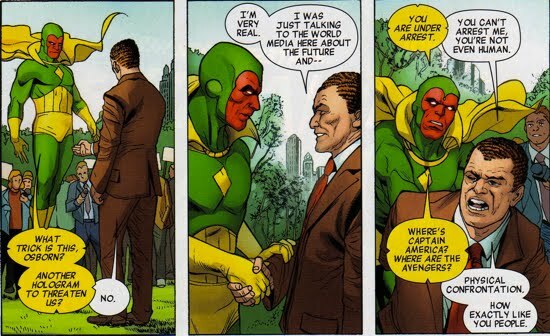 Recall that Norman actually met (and ‘saved the life’ of the President) at the onset of his Dark Reign. 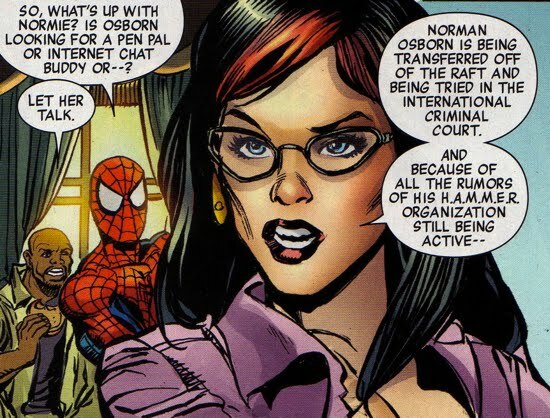 The President’s staff reminded him that Osborn’s claims were not entirely false, and that Norman was arrested for something that Stark does on a regular basis. However, the President did not waver as he was well aware that Osborn was (and is) insane. 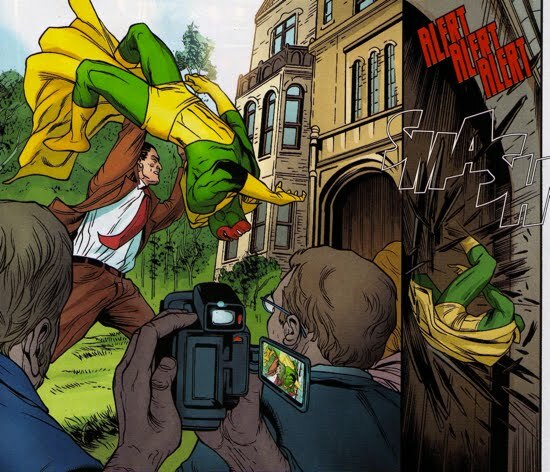 When the Vision made his way back to Avengers Mansion, he found Osborn on the front lawn addressing the media. 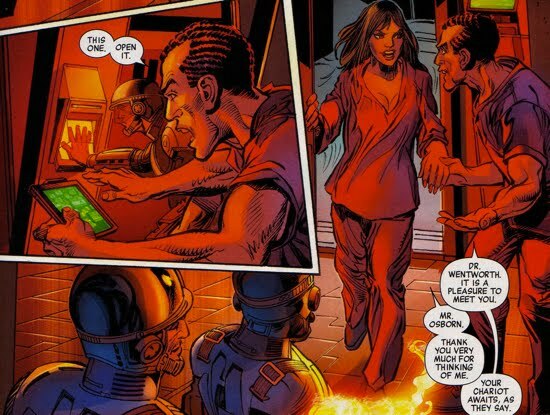 The Vision tried to place Osborn under arrest. Norman took the opportunity to beat the crap out of the Vision but not before first shaking his hand (this will become important later). The media broadcasted the incident and after the President watched the events unfold, he arranged a meeting with Osborn. Meanwhile, the Avenger Quake tracked down the man who planted the holographic device at the press conference and demanded to know Osborn’s whereabouts. 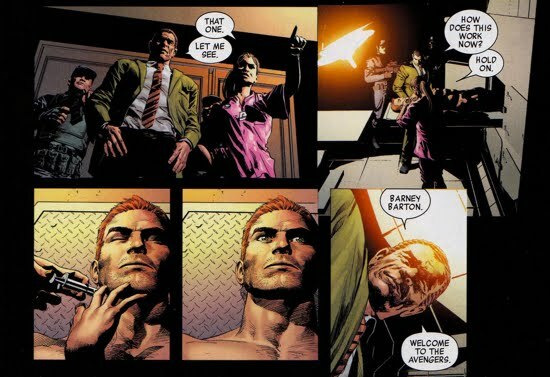 The President’s arranged meeting with Osborn took place in The Avengers (V4) #23, and the meeting featured a surrogate for both Osborn and the President. Negotiating in Osborn’s place was Madame Hydra and she had some bold demands for the President. 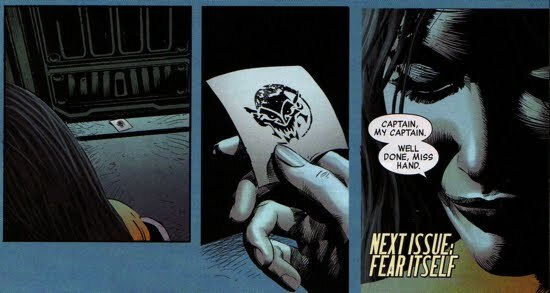 In exchange for the release of Captain America, Madame Hydra wanted to the Federal Government to arrest Cap (as well as the rest of the Avengers). Moreover, she wanted the President to install the new H.A.M.M.E.R. organization as the new global peace-keeping force. The President denied her request (for good reason) and upon hearing the denial, Madame Hydra unleashed a lethal force upon government’s forces. The H.A.M.M.E.R. 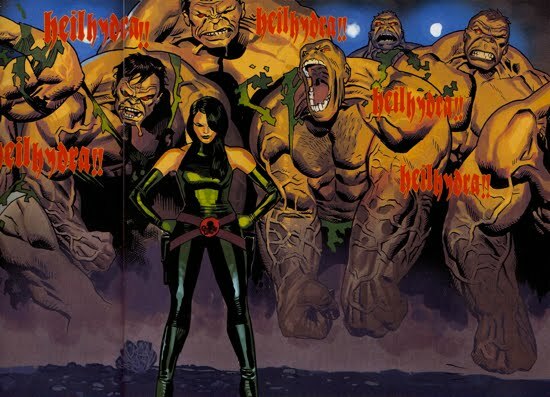 troops that surrounded Madame Hydra quickly morphed into Hulk-like monsters and destroyed the army’s tanks and helicopters. Meanwhile Osborn, who had just tossed The Vision through the walls of Avengers Mansion, was caught on video flying (literally, no help from a device of any kind) away from the scene. The Vision then pursued Osborn in flight. Quake eventually made her way to H.A.M.M.E.R. headquarters and freed her fellow Avengers (Iron Man, Storm, Red Hulk, Spider-Woman, and Hawkeye). The group was not fortunate enough to escape Osborn though, as he stood there waiting for them (with the subdued Vision in his grip) surrounded by hundreds of Hand ninjas. Interestingly, Osborn greeted the group with a remark insinuating that he was now a government-sanctioned law enforcer. He was obviously lying, but the Avengers would have had no way of knowing the truth. Despite the fact that Osborn’s negotiations with the President broke down, the government seized the Avengers Mansion as seen in New Avengers (V2) #22 and The Avengers (V4) #23. It did not seem like the entire Federal Government was on the same page at that point. Regardless, when the new Avengers arrived at the mansion they clashed with government forces. The group eventually transported safely away from the conflict (thanks to Dr. Strange) to Strange’s Sanctum Sanctorum in order to figure out a plan of action. The team tracked down Victoria Hand and eventually get the full-scoop from her, after subjecting her to a handful of questionable interrogation tactics. Victoria explained to the team that she was a triple agent, under the direction of Captain America, with the goal of befriending Osborn in order to bring his operation to light. The problem was that Cap was abducted and she was left hanging. Meanwhile, the new (Dark) Avengers watched all these events transpire on television and eventually word reached the team (via Gorgon) that Cap was in their custody. Skaar, the mole within the new (Dark) Avengers, understood that that news was his queue to end his undercover role and destroy his 'fellow teammates’. Skaar’s decimation of the new (Dark) Avengers continued in New Avengers (V2) #23 and eventually the Hulk’s son made his way to Cap’s prison cell to free him. The new Avengers soon joined Skaar at H.A.M.M.E.R. headquarters and aided him in subduing Osborn’s team. The entire new (Dark) Avengers roster was taken into custody and the new Avengers soon joined the rest of the Avengers. Osborn’s second attempt at becoming a ‘legitimate hero’ culminated in The Avengers (V4) #24. About two weeks prior to having the Avengers cornered in his H.A.M.M.E.R. headquarters, he had initiated a drastic physiological conversion of himself with the aid of A.I.M. Scientist Supreme Dr. Rappaccini. At some point after his initial attempts to steal Stark’s armor, Norman gave up the idea of trying to reprise his role as the Iron Patriot (or something similar) because he did not want ‘to repeat himself’. Dr. Rappaccini then devised a way to incorporate the Super Adaptoid’s technology for Osborn’s personal use (thus his ability to fly after shaking The Vision’s hand). Rappiccini provided Osborn with the rules for utilizing the Super Adaptoid's technology efficiently. She explained that anything with ‘genetic physical abilities (mutant or accident-based)’ that he touched would cause his body to adapt to those abilities (ie, he would have their power-set by touching them). This capability was later referred to by Tony Stark as ‘replicating neurocytoma transmotor’. The only drawback was that he would have to be careful not to mix-and-match too much because his body may not be able to handle the accumulated powers. Osborn agreed to perform the transformation. Returning to present time where Osborn had the Avengers trapped, the Red Hulk decided to attack Osborn and the monster landed a pretty solid punch. 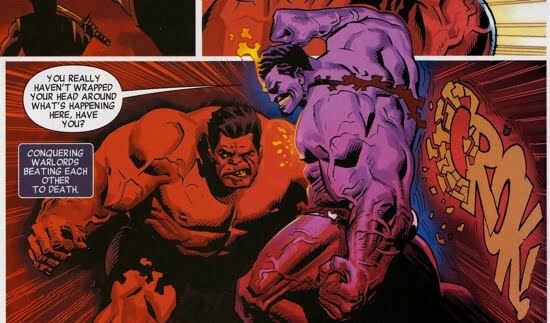 But the contact between the Red Hulk and Osborn transfered the Red Hulk’s powers to the former Green Goblin as Osborn hulked-out and became a giant Purple-ish colored Hulk-Osborn. Osborn ruminated to himself that this was the moment he had always dreamed of, gaining true power. The Hulk-Osborn attacked the Avengers, luckily Storm was able to temporarily neutralize him. She launched the purple monster up into the atmosphere, buying the Avengers a brief respite. Interestingly, Osborn’s internal monologue slowly shifted from this thought that he was the inevitable future of mankind to a feeling of futility toward his actions. Osborn pondered, “They think we’re fighting a war of ideals…But now I know it is what is always has been…and we are who we always have been. Barbarians!”. It was quite clear that Osborn’s psychology shifted once he had Hulk’s powers, begging the question of whether he ever truly bought-in to the ‘he is the future’ notion. Or was it possible that when he adapted to the Hulk’s powers that his brain changed as well? Regardless, the Avengers quickly subdued the Hand ninjas whilst Osborn was up in the lower atmosphere. When Osborn landed back down on Earth, the heroes had already devised a plan to beat him. They all attacked Osborn with...hugs? Well, technically they overloaded his Super Adaptoid tech by simultaneously touching him, causing his body to melt down (literally). Osborn was easily defeated. The traitorous Agent Washington was placed under arrest and all the H.A.M.M.E.R. facilities were locked down. Captain America summarized Osborn's fate as, "Norman is in custody. But the S.H.I.E.L.D. doctors say he is in a deep coma. His brain is fried. And his body, well, he has no one to blame but himself". Sounds like Osborn is in dire straits. His recruits faired a little better because the new (Dark) Avengers were assimilated into the Thunderbolts initiative. Also, S.H.I.E.L.D. arrested 3,300 H.A.M.M.E.R./A.I.M./Hand operatives. However, the Avengers efforts did not fully derail Madame Hydra. At the conclusion of the story, Madame Hydra was seen rallying a group of Avenger-powered Hydra soldiers, all of whom chanted ‘Hail Hydra’. 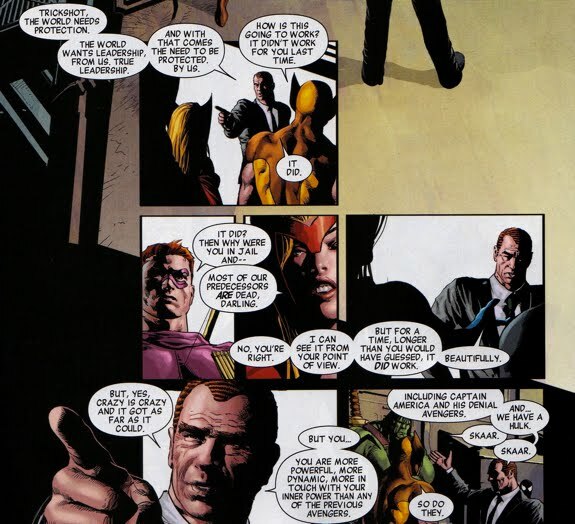 The whole premise behind Osborn's strategy to defeat the Avengers breaks down upon closer inspection. The 'secrets of the entire superhuman community' were handed to Norman on a silver platter by Dr. Carolina Washington. These 'secrets' allowed him to transform his loyal H.A.M.M.E.R. infantry into hybridized-psuedo-Avengers, after which they did some impressive deeds with their newfound power-sets (ie, capture the Avengers and go toe-to-toe with U.S. military). But Osborn was not satisfied, and he requested that Dr. Rappaccini generate something special for him. Enter: The Super-Adaptoid technology, a tech designed to mimic a power-set by simply touching the super-powered individual. The most baffling aspect of Osborn's plan was why he would resort to requiring the physical contact of an Avenger in order to mimic their power(s) (ie, use the Super-Adaptoid technology), when he already figured out how to mimic their powers by using the 'superhuman secrets'. If Osborn wanted the Hulk's powers, why allow him to punch you in the face as opposed to just making himself Hulk-out the way the H.A.M.M.E.R. soldiers did with Madame Hydra in The Avengers (V4) #23? The lack of an organic explanation as to why Osborn would do this ruins this story arc. In my opinion, there are a-million-and-one explanations that could have been conjured up to explain Osborn's decision. For instance, the H.A.M.M.E.R. soldiers' transformation may have been unstable or even irreversible, causing a detrimental result to anyone who used these (yet to be optimized) 'secrets'. Or possibly the superhuman secrets were necessary to build the Super-Adaptoid tech that Osborn used, thus the 'secrets' led to the Super-Adaptoid tech. 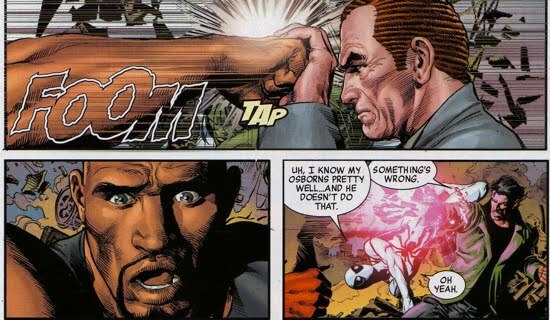 Furthermore in New Avengers (V2) #20, Norman was aggressively attacked by Luke Cage (who throws a punch Norman's way) and he has no trouble deflecting Cage's assault. The neutralization of Cage was so casual that Spider-Man immediately noticed something was awry with Osborn. Norman had enhanced his strength somehow and the logical conclusion (by the reader) was that it was due to his access to the 'superhuman secrets'. It certainly was not the Super-Adaptoid technology because (as seen in Avengers (V4) #24) the 'adapting' took some time (which is why the Red Hulk's initial punch sent Osborn flying across the room). Bottom line, there is no reasonable in-story explanation as to why Osborn was super-strong against Cage, yet still he required the use of the Super-Adaptoid technology later in the story. So what gives? Did Osborn simply want more power? If so, what did this self-enhancement have to do with debunking the Avengers and re-establishing himself as the leader of a national peace-keeping task force?? Lastly, the public's discontent with the Avengers (and their actions) seemed a bit forced and hypocritical throughout the arc. After the new Avengers thwarted Superia in Rhode Island, they worked alongside the authorities and the EMT's after the conflict. Since everyone cooperated reasonably well, it was difficult (as a reader) to buy that there was an accumulating frustration against the Avengers (as depicted later in this arc). 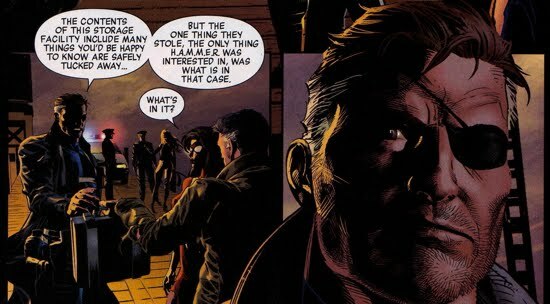 The public (and law enforcement officials) would have to be considerably naive and forgetful to immediately go back to faulting the Avengers for everything that is wrong with society...especially after Osborn already capitalized on that sentiment post-Secret Invasion.